Boasting 4 dining options, Mövenpick Hotel Karachi features an outdoor pool, fitness centre, free parking and luxurious rooms with city views. 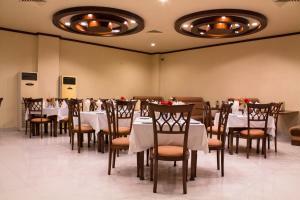 Conference and banquet facilities can be arranged, while the friendly staff is available round-the-clock. Situated along Club Road, the hotel is about 1.9 miles to the National Museum and 3.2 miles to Clifton Fish Aquarium. Askari Park is 6.2 miles away, while Jinnah International Airport is accessible with a 10.6 miles drive. Fitted with carpet flooring, air-conditioned rooms are elegantly furnished with a safe, minibar, electric kettle and a flat-screen TV. 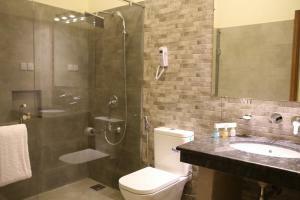 The en suite bathroom comes equipped with shower facility, bathtub and free toiletries. Hairdryer and ironing facilities are also provided. 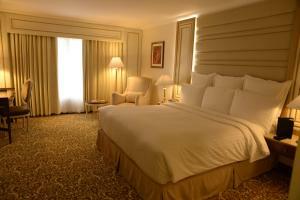 Guests staying at Mövenpick Hotel Karachi can request for laundry, dry cleaning and massage services. Car rentals and tour arrangements can be made, while luggage storage and currency exchange are also provided. Wi-Fi access is available for guests at a surcharge. Serving authentic Lebanese cuisine, Kabab-Ji Restaurant offers à la carte dinner menu while Al Bustan restaurant provides buffets of Pakistani and International dishes. Tasty Italian desserts and pasta are available at La Mamma while local snacks can be enjoyed at the 24-hour coffee shop. Offering panoramic views of the sea, Ramada Creek is set in Karachi. Guests can enjoy the on-site restaurant. Each room at this hotel is air conditioned and features a TV with satellite channels. Some rooms feature a seating area where you can relax. Rooms are fitted with a private bathroom. Extras include bathrobes, slippers and free toiletries. You will find a 24-hour front desk at the property. You can play tennis at the hotel. Jinnah Airport is 9.3 miles from the property. Located opposite Frere Hall and Park, the 5-star Karachi Marriott Hotel offers modern and luxurious rooms with a flat-screen cable TV. 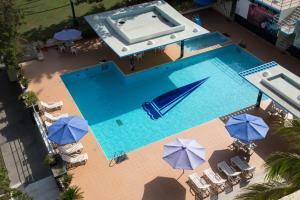 It features 3 dining options, spa and outdoor swimming pool. The air-conditioned and fully carpeted rooms each have its own private bathroom, which include free toiletries, shower, hairdryer and slippers. An electric kettle and minibar can be found in each room. 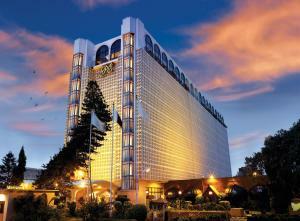 Karachi Marriott Hotel is 350 yards from the Hockey Club of Pakistan and 650 yards from Holy Trinity Cathedral. National Museum of Pakistan is 1.1 miles away. Karachi Jinnah International Airport is 9.3 miles from the hotel. Guests have access to a 24-hour business centre while those staying on the executive level can use a private lounge. Conveniently located in the hotel is a drugstore, florist and currency exchange. Laundry and dry cleaning services are available at an extra cost. Nadia Coffee Shop -Coffee House features an à la carte menu of European and Pakistani cuisine. Dumpukht Restaurant offers barbecue dishes and live cooking demonstrations. Order Chinese dishes at Suzie Wong Restaurant. Located in suburban Karachi just 20 minutes ride from the Jinnah International Airport the 5 Star Dreamworld Resort, Hotel and Golf Course offers luxurious rooms with flat screens (in some rooms more than one) satellite channels, 18 hole PGA standard Golf Course, outdoor swimming pools, water park, boating lake, bowling, horse riding, archery and 160+ other facilities!Every room has individual dedicated air-conditioning, private bathroom (more than one in some rooms) electronic safe, mini-bar and writing/dining table and seating. Free hi-speed Wi-Fi is accessible throughout the 144 acres of the resort premises. 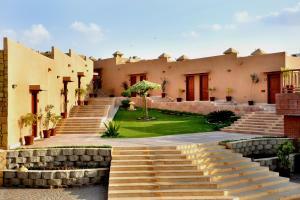 A jogging track and separate spa for women is also at guest’s disposal. Authentic cuisine is offered at the 5 onsite restaurants serving fast food, Pakistani & Chinese delicacies. Food can be ordered in the room 24/7 from Bistro, our continental food outlet. Access to main city attractions is easy and readily available, while luxury vehicles can be rented on premises any time. Concierge/front desk is available round-the-clock. 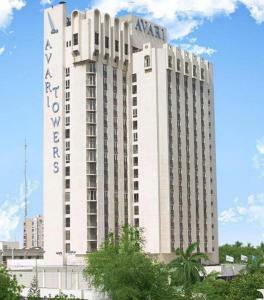 Avari Tower features an outdoor pool, spa and fitness centre. 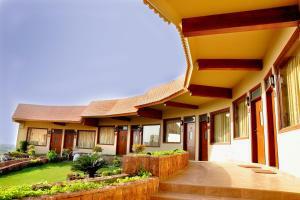 Offering modern air conditioned rooms, the property provides free WiFi in all areas. It is 9.3 miles from Jinnah Airport. Rooms come with a flat-screen cable/satellite TV, safety deposit box and minibar. Shower facilities are included in private bathrooms. Staff at the 24-hour front desk can assist guests with currency exchange and laundry service. The hotel has a tennis court and business centre. 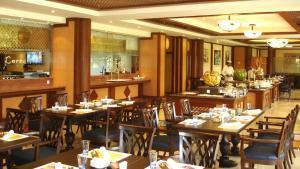 Guests can enjoy a variety of cuisines at the hotel?s dining outlets. Featuring free WiFi, a spa centre and an outdoor pool, Beach Luxury Hotel offers accommodation in Kar?chi. Guests can enjoy the on-site restaurant. Free private parking is available on site. Every room at this hotel is air conditioned and features a flat-screen TV. Some rooms have a seating area where you can relax. Some units feature views of the sea or garden. All rooms are fitted with a private bathroom. Extras include bath robes, slippers and free toiletries. 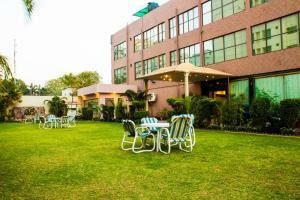 The nearest airport is Jinnah Airport, 11.8 miles from Beach Luxury Hotel. You will find a 24-hour front desk at the property. 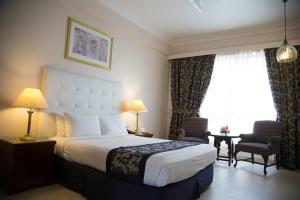 Located in the commercial centre of south central Karachi, The 5-star Pearl Continental Hotel offers luxurious and modern rooms with free Wi-Fi. 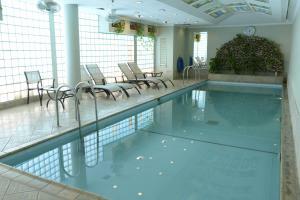 6 dining options and an indoor pool await guests. 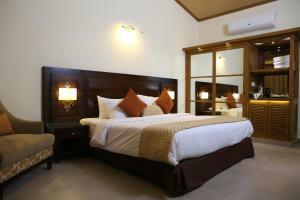 Air-conditioned and fully carpeted, each room features a flat-screen satellite TV, minibar and iron. Private bathroom includes a hair dryer and shower. A seating area, safe and coffee machine is standard in all rooms. Guests who drive enjoy valet and free private parking. Conveniences include a car rental, concierge and tour desk. Karachi's city centre, Saddar is 2 km from the hotel. Jinnah International Airport is approximately 16 km or a 30-minute drive away. 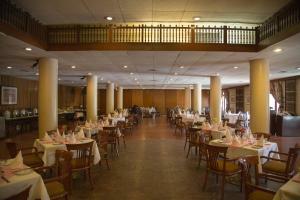 A variety of dining options are available at Pearl Continental Hotel, Karachi. These include European dishes at Marco Polo Restaurant and Japanese meals at Sakura Restaurant. Chandni Restaurant offers Pakistani cuisine. There are also restaurants serving Chinese and American food. Offering a sun terrace and views of the city, Hotel Crown Inn is located in Kar?chi. Free WiFi Is available throughout the property. All rooms have a flat-screen TV. Some units feature a seating area for your convenience. Each room comes with a private bathroom. Extras include bath robes, slippers and free toiletries. There is a 24-hour front desk, a cash machine and gift shop at the property. Guests can enjoy the on-site restaurant. The hotel also offers car hire. Jinnah Airport is 9.3 miles away. Free parking is available on site. 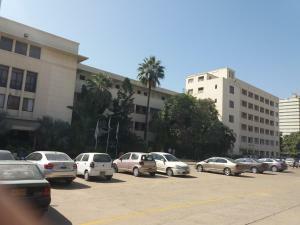 Country Inn hotel ideally located in the heart of Karachi at main Shahrah-e-Faisal Road. 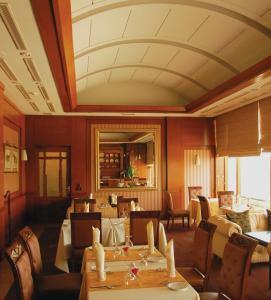 Red Crab Lounge offers Pakistani, Continental and Chinese cuisines for guests. Guests can enjoy free WiFi and free private parking on site. All rooms are are inspired by a unique combination of modern and minimalist design. Each room features air-conditioning, LED, fridge, personal safety box, writing desk and stationery and I. D.D telephone. There is a banguet hall and a conference hall in the property. The hotel also offers car hire. Jinnah Airport is 6.8 miles away.